My, things are crazy busy between custom orders and shows! 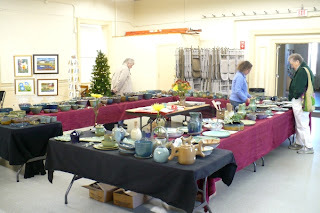 I want to share with you some pictures from the show I did last weekend with two other artists: a potter and a jeweler. 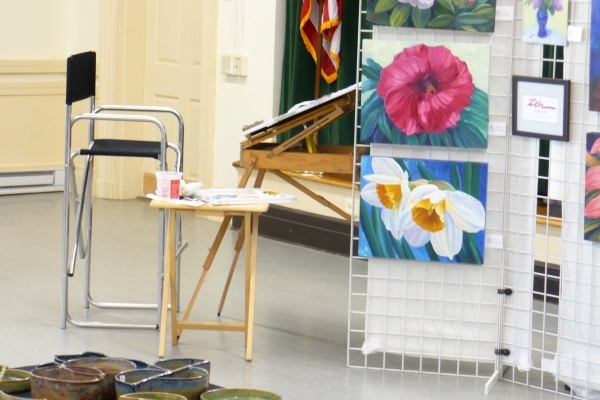 It was part of a much larger Artists Open Studio tour that takes place in our area every year with dozens of artist studios open. I exhibit the first weekend at a centralized location with other artists because some of my customers prefer that rather than driving way out into the boonies to get to my studio! 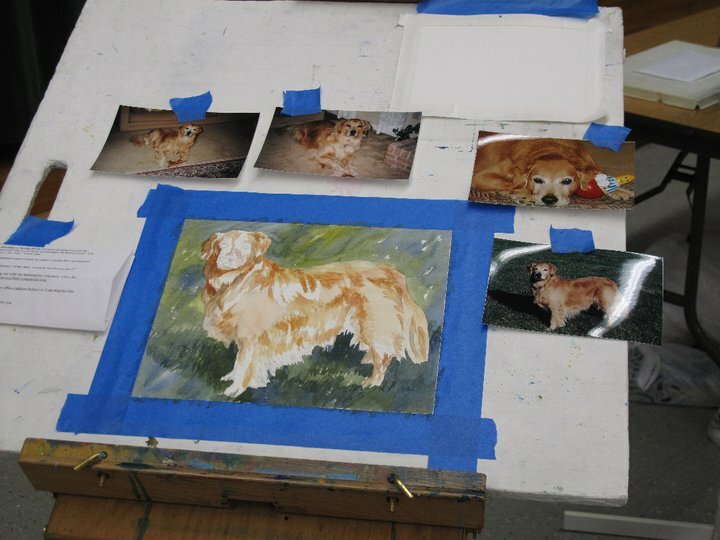 The second weekend is by invitation only to my own studio. I had to take pictures when things slowed down a bit, because when it was busy, there was just no time. 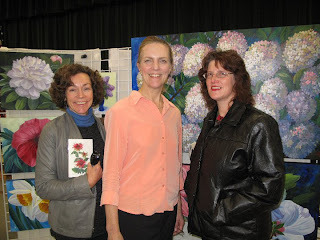 In this photo, that's me in the middle with two of my regular collectors. It's such great fun to see people in person especially when selling mostly online throughout the year. I also love meeting people whom I'd only known online previously and that happened several times this past weekend. Here is my easel setup for watercolors to do painting demonstrations. Since I have so many pet portraits to get done before Christmas, I worked on some of them. People love to see the process and they had lots of great questions. Below is one of the paintings in progress. The space in which we exhibited is the community room of an historic building. It has wonderful lighting and lots of room. 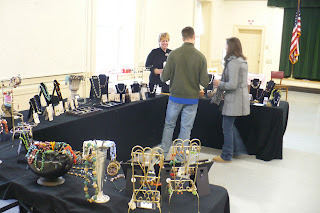 It was great to be able to spread out my display around two sides of the room to take up the space. 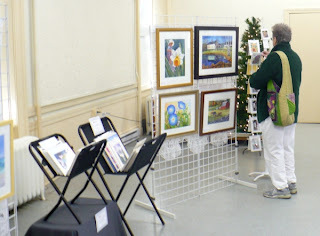 Normally during a show, artists get a 10' x 10' space if that! The center of the room was filled by Joey Sage Jablonski and her Funkware pottery. Joey makes delightful and unique ceramic items - plates, bowls, mugs and vases, many of which feature nature and small critters such as frogs. She has a very dedicated following of collectors. The other artist was Helen Malchow, who makes jewelry from polymers, vintage glass, brass, gemstones and sterling and quirky, creative jewelry boxes. Helen is a high-spirited and fun person to know. Her energy is contagious and draws people to her. She has a great following of people who delight in her work. All in all, it was a very successful weekend spent with collectors and two professional and dedicated artists. Lots of sales and lots of fun. I enjoyed every minute of it!